Pulling rank on a 4×4-wielding younger relative was never more fun. Especially when it meant making the acquaintance of a road never travelled. That he himself is an off-roading enthusiast meant the proverbial gun to the head would remain cable-locked. 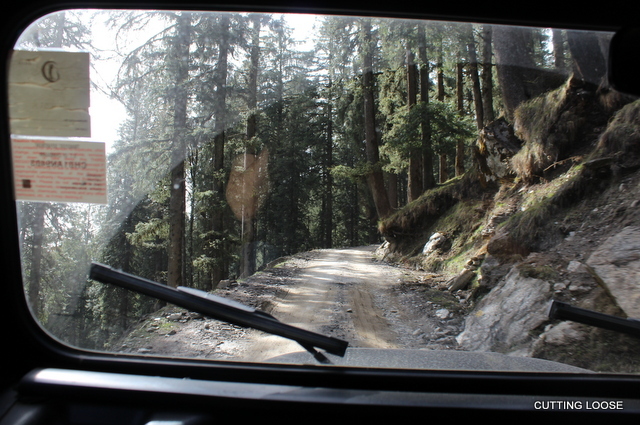 We started early from Chandigarh with the intention of hitting Tirthan Valley before sundown that same day. 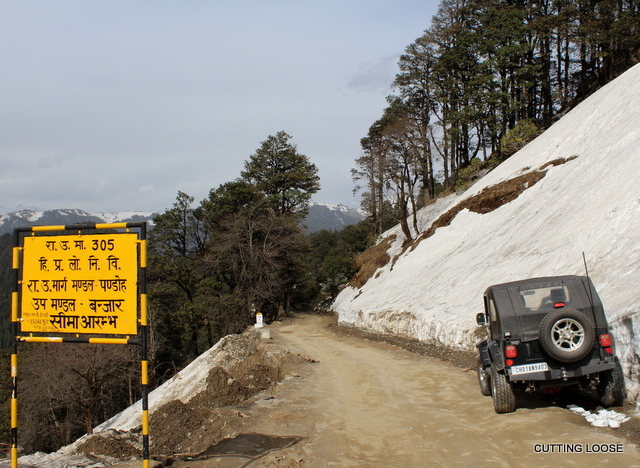 Our chosen route would take us via Shimla, past Kufri, Theog, Matiana and Narkanda towards Rampur. 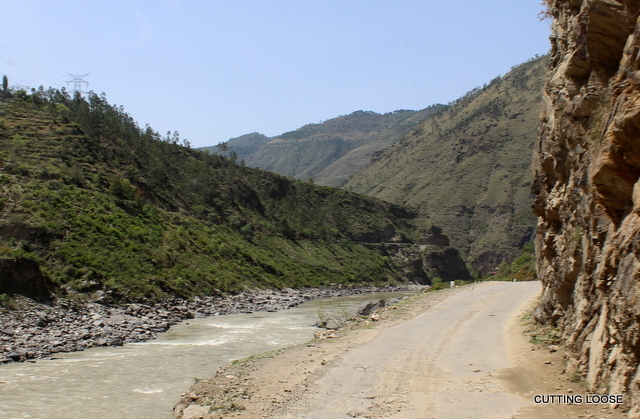 At Sainj, we would veer left towards Ani and Khanag; the latter a few kilometres short of Jalori Top. 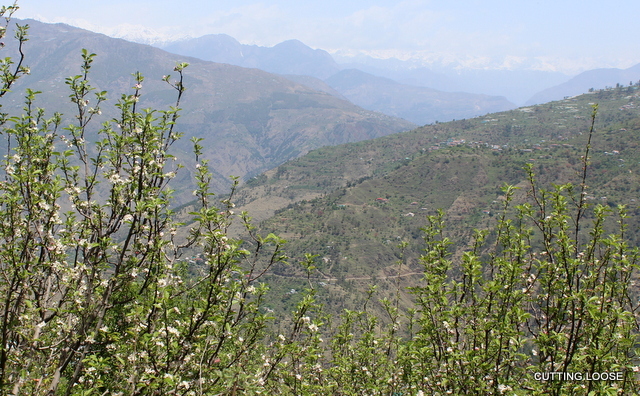 The extended winter this year, pushing spring by a few weeks, treated us to flowering apple orchards well into April. Caught these coy white blossoms blushing pink along the highway somewhere between Theog and Matiana. 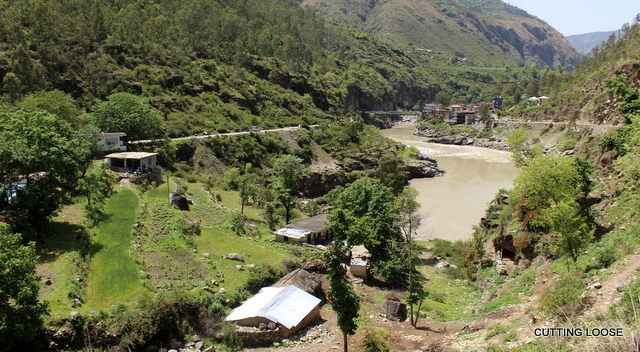 We wound our way down to cross the Satluj at Luhri, a sleepy little place in the news a couple of years ago for a controversial hydro power project that saw dogged resistance by villagers and environmental activists. Once over the bridge, we turned left through the cramped marketplace to begin a gradual climb to Ani, some 20 kilometres away, where we intended to make a pit stop at the colonial-era rest house. The road is narrow, winding, largely devoid of traffic but replete with pretty scenes if you’re not flying over indifferent patches to just get somewhere. We were in no hurry that day and seriously enjoyed tracing this section of the NH305 that connects Sainj on NH22 with Aut on NH21. Locales such as these were par for the course. Were it not for rude reminders like that dug-out in the background, nothing would have stopped us from labeling this spot as idyllic. Regrettably, transformation of this heavenly spot into the exact opposite will only be a matter of time if the massive power project is not shelved. Nearly 50 kilometres of the river is likely to run dry and affect up to 80 villages in the three districts of Kullu, Mandi and Shimla. 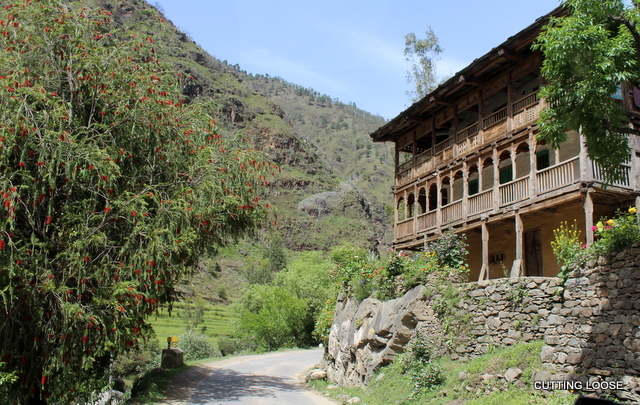 And traditional homes like the one in the picture above, a fast dwindling sight as it is, will then be seen only in travel blogs like this one. The surrounds took on a more alpine flavour as we closed in on Khanag, roughly five kilometres short of the Pass. This stretch, minus most of its tar, slowed us down considerably, allowing us many photographic moments even though we were a tad disappointed at not sighting any snow. Something we got aplenty of soon as we crested Jalori and a few kilometres beyond. Pleased as punch from a successful foraging of guchchi, a type of sponge mushroom that commands a gob-smacking price (last count Rs 15,000 per kg) in the world of gastronomy, this couple very kindly offered to pose for us. Just like that. The gent even spread out his harvest most generously so I could get a closer look at the ridged fungi. 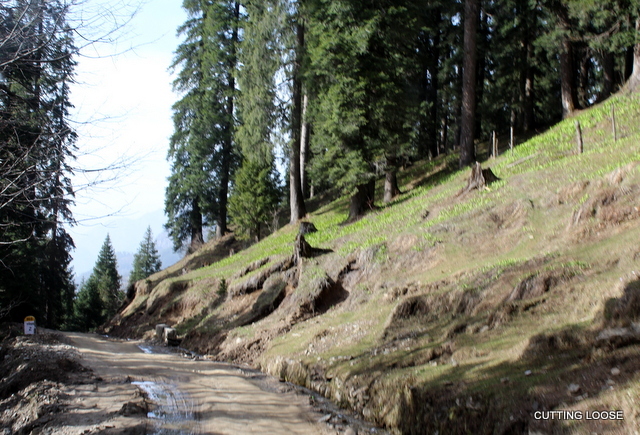 Found at heights ranging between five to ten thousand feet where deodar and kail forests abound, the nutritious and flavourful fungus is said to sprout on the ground as well as on trees. 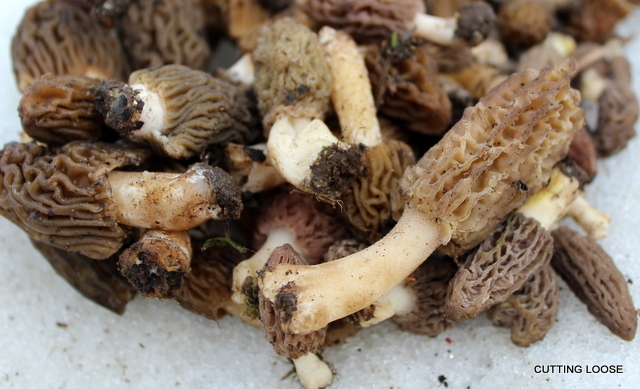 It comes visible soon as the snow melt begins and is known to die at first rain thereafter. Melting snows also reveal the minty fresh blades of the wild Iris that spring from the ground in April-May. Carpeting soon after (June-July) every available hillside with bursts of mauve as the flower blooms to its short-lived glory. The descent to Tirthan was a marvelous stretch save for burgeoning Banjar where parking could be a possible nightmare – try not to stop and shop! 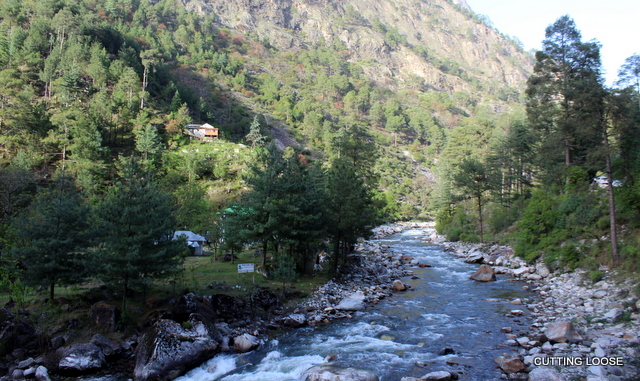 For starters, we didn’t want to keep ourselves from this delightful vision of the Tirthan river at sundown. Nor that well-earned sun-downer after the 10-hours it took us to get there. Cheers! Note: I re-traced this route in a hatchback more recently. For long I believed that would be a challenge. Apparently not. Long as Driver No.1 is at the wheel. Salutations to the well documented journey to the End of the Habitable World ! What a well written piece indeed – feel I was in the vehicle with you ! 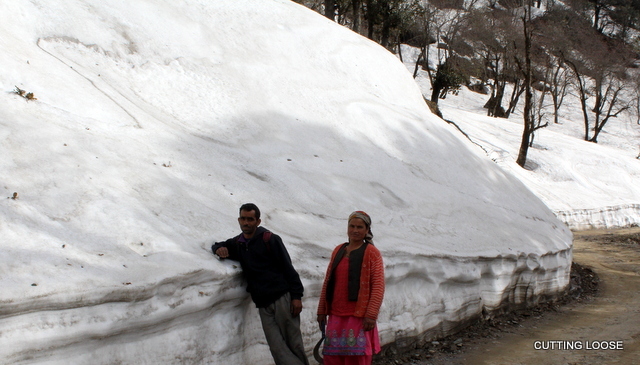 Thanks Robin…I love road-tripping in Himachal. Shows, I guess! Yet another piece written with such amazing beauty and grace. The same feel that Stephen Alter has for the mountains. Such a blessing, such a gift. The Himalayas and it’s people could never get a better spokesperson than you. Thanks, Ajai. You recognize the call of the mountains just as well, haina? 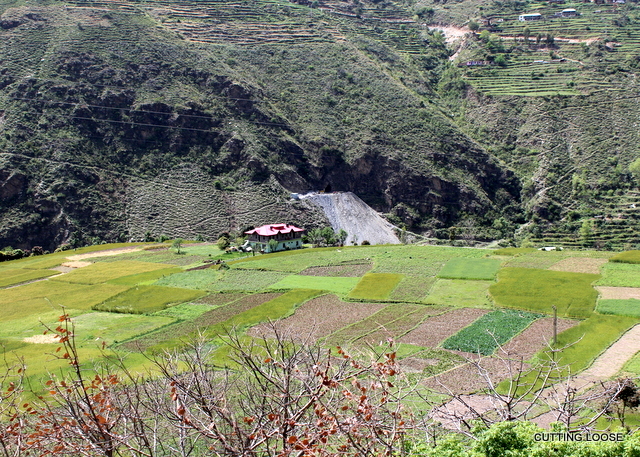 Sangla, Rajnish? Respect. The cliffhanger you experienced colours this one tame! So well written , the pictures added to the beauty of the write up. I have lived Himachal but could not visit this part. Thanks for experiencing it through your journey. Glad you enjoyed the ride. Thanks for stopping by.